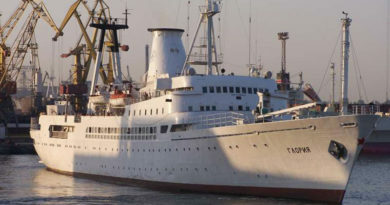 In the former Soviet Republic of Georgia, being dead is a bit of an inconvenience – but it’s no reason to miss out on a social life. 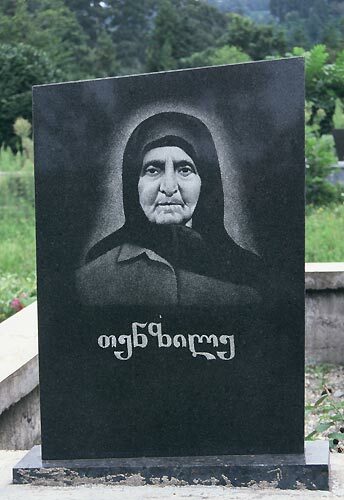 Grave of an elderly woman at Batumi. 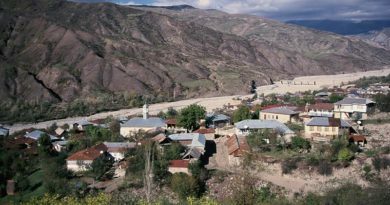 Socialising in this little known, often troubled country on the southern flanks of the Caucasus Mountains revolves around feasting and drinking copious amounts of local wine. There’s no point inviting the dead around for drinks, but the living have adapted to the more sedentary habits of their ex-relatives – making sure that passing away doesn’t mean being passed over. In a Georgian cemetery most graves come equipped with a table and chairs. Here the families and friends of the deceased gather to eat, drink and remember old times, often leaving behind an offering of spirits, bread and cheese for the dead. On Sundays, and All Souls’ Day in particular, Georgia’s cemeteries are full of… life. 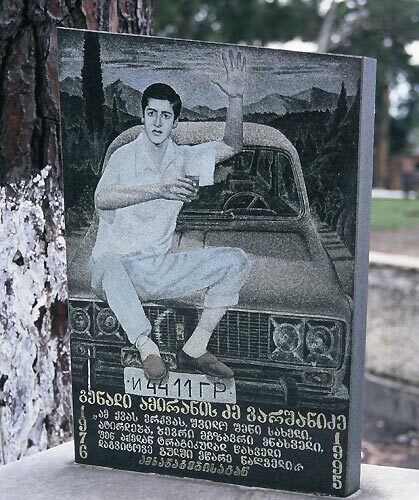 The sense that the dead never left is heightened by the Georgians’ custom – shared by the Armenians across the border – of engraving their black marble tombstones with remarkably life-like images of the dead. The Georgians are no fans of idealised portraits, preferring instead photos of the deceased engaged in their favourite pastimes. Hence the mustachioed man seated in a forest, nibbling a bunch of grapes; or the war veterans posturing with Kalashnikovs and ammunition belts. One young man is shown perched on the bonnet of his modifed Lada, raising a glass of beer – whether a celebration of his life or a warning about his means of death, it’s hard to say. Another gravestone shows four dark, handsome siblings with a single date of death. Etched in the background is a car frozen in mid-air as it misses a bend on a winding mountain road and smashes through a barrier. Death in the Caucasus is not something to be squeamish about, hidden away or cloaked in euphemisms. The Georgians celebrate their dead the same way they embrace life – with passion, defiance and enough home-made wine to kill people of lesser nations. 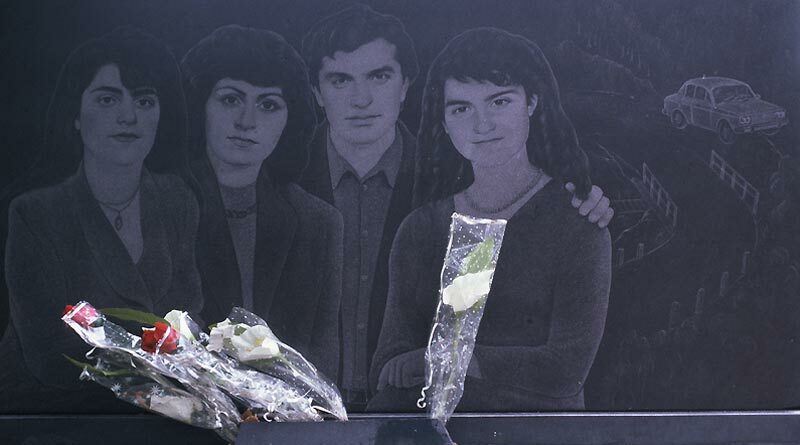 If you want to understand how this tiny country endured decades of Soviet rule, civil war and economic meltdown – yet survived with its spirit intact – you could do worse than visit a Georgian cemetery. 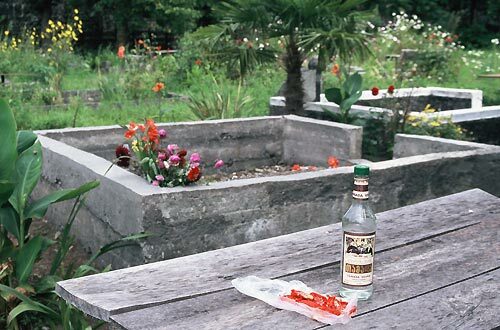 Home-made snacks and a bottle of vodka left at a Georgian grave. Just remember to bring a little something to share with the dead. First published in the New Zealand Listener, September 2006.